There are so many camcorder available in the market. Many of them is marketed toward middle range, camcorder in this range have many good features and comes with more affordable price. 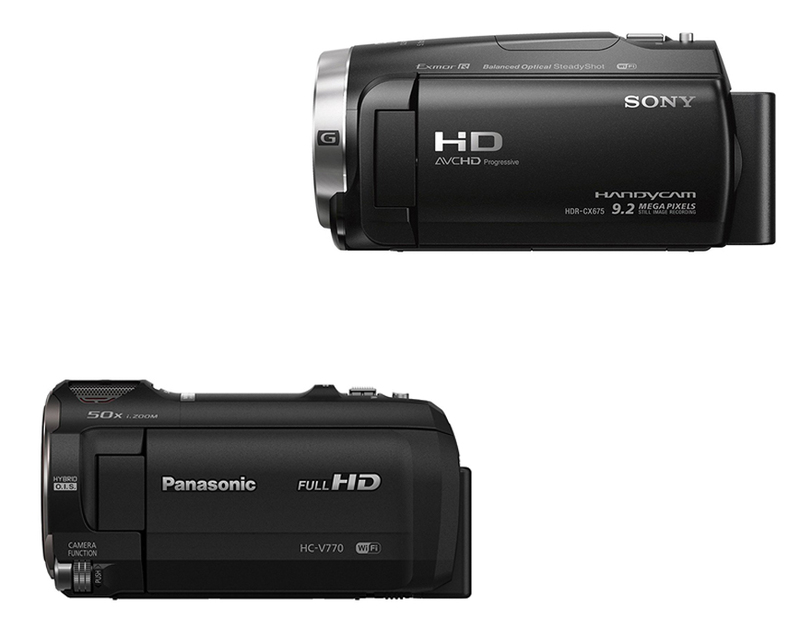 If you are currently looking for a good and affordable camcorder, here in this article we will introduce you to two of middle range camcorder, which has a great quality and price, they are Panasonic HC V770 and Sony CX675. – What is Panasonic HC V770 and Sony CX675. – What Panasonic HC V770 and Sony CX675 can offer to you. – Panasonic HC V770 vs Sony CX675. Panasonic HC V770 is the camcorder manufactured by Panasonic and was planted with Flash Memory Wi-Fi. This camcorder able to record into SD, SDHC, and SDXC memory card in Full HD videos. The design look on this series doesn’t differ much from HC-V750, since the company claims that the improvements is internal. The menus on this camcorder can be easily operated through the 3-inch touchscreen, making there is no need for the physical buttons placed near the screen. The most useful feature in this series is the multi manual dial, which you can push or spin to make an adjustment to a particular manual parameter. This dial able to choose to focus, iris, sharpness, shutter speed, color saturation, brightness and white balanced settings. If the screen is open all the way, you can access many dedicated functions such as the common playback and power buttons, level shots, and Wi-Fi shortcuts. The HC-V770 also featured with and A/V and mic jack, a micro HDMI, and USB Port. This camcorder featured with high density, ultra smooth video at 1080/60p it able to record in Full HD 1920 x 1080, 60 Progressive frames per seconds. It also built with a fast F1.8-F3.6 lens that was specially made for HC-V770 to help you recording under minimum lightening. Read our previous comparison about Panasonic HC V770 vs Canon vixia HF R62 here. The wide angle of 29.5mm lens it has also allow this camcorder to fit more people in the background to the frame better than conventional lens. The back illuminated imaging sensor available in HC-V770 is as large as ½.33” High Sensitivity MOS Sensor, which able to provide up to 1920 x 1080 HD resolution and also improving the video in a low light condition. When taking still pictures this camcorder is able to takes 24.0 megapixel pictures. Taken from their homepage, aside from that the new hybrid technology available in this camcorder makes it able to do 20x optical zooming and 60x digital image zooming. Sony CX675 is a camcorder that has a great price to performance ratio, it also has a better optics and ergonomics. This kind of feature placed the camcorder in a precarious spot. Sony HDR CX675 is really good because it is combining a powerful lens with the familiarity of Sony basic model. This camcorder is designed for people who need to record video in extra high quality but doesn’t want the bulky and big size that often gets in the way and making the camera less portable. The main feature of Sony HDR CX675, which set it separate from its lower priced sibling is the Sony G Lens planted inside the camcorder. This feature may use the same BIONZ X Image processor and Exmor R CMOS sensor you can find in CX455 but the 46mm really makes a difference when it comes to raw video quality. Different from lenses like ZEISS, with this lens you can get the same 26.8 mm wide angle, and able to do optical zoom until 30x. The second feature which set this camcorder apart from the other is Sony’s Balanced Optical SteadyShot image stabilization. The way this technology stabilize an image is really good, it makes the lens housing move as the camera is being moved too. You will have such an experience when using this camera to record in a rocking boat for example. With the Intelligent Active mode, you also can record a fairly stable video while running carrying the camcorder too. There is also 32 GB of memory, it has enough memory if you want to bring it on your vocation to record all our video. Since this camcorder are not able to take a 4K video the amount of 32 GB should be enough. If the amount isn’t sufficient you also can use Memory Stick Micro or microSD card. You can store even more if you are willing to lower the quality to 720p. It is quite hard when it times to compare both of them, you might want to see their specification side by side before deciding on one of them. What we can say is that these Panasonic HC V770 Sony HDR CX675 features is almost similar. What we notice is that HC V770 have no self-timer, while CX 675 has it. The other is the slow motion feature which is present in HC V770 but is not available in CX675. The price gap between both of them is about $100, with Sony HDR CX675 being the pricier. Based on the features we explained above, we recommend you to choose the cheaper Panasonic HC V770.